Escape to this large one bedroom condo, furnished in Northwest style. The king-sized bed is dressed in soft cotton linens, with a TV/DVD player, and private bath. The living area features plenty of seating, comfy new sleeper sofa, fireplace and TV / DVD player. Enjoy a large selection of movies, books, and many fun games, including WiFi. A well equipped kitchen is ready for simply popping in a pizza, or preparing a gourmet feast. Take in a beautiful sunset from cushioned Adirondack chairs on the private covered deck, or slip into the hot tub at the clubhouse just a few steps away. Also enjoy the gym, heated pool, outdoor BBQ and fireplace, playground, basketball court and putting green--No extra charge! 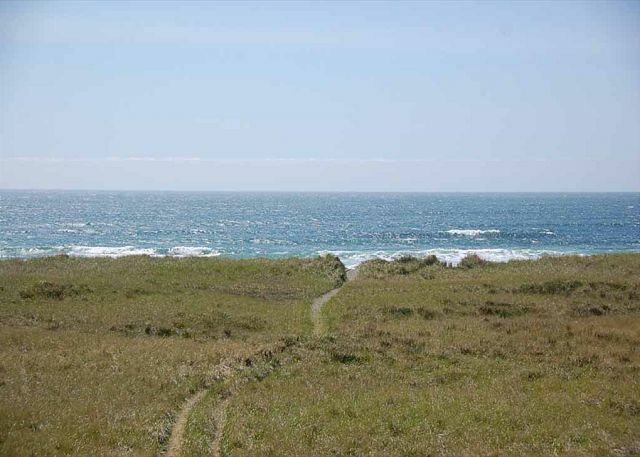 Take a hike along the shore, or the paved path, perhaps tour the lighthouse next door. This is just the place to treat yourself to the relaxation and recreation time you need. We have stayed in this unit multiple times now and it is absolutely wonderful. The view is unbelievable. In this unit you will find everything you need for a comfortable stay. We will continue to stay here. Wonderful to hear you had another enjoyable visit with us. We look forward to seeing you again! View of the ocean was perfect from sunrise to sunset. this rental was perfect for our weekend stay in Westport. Location was close to the beach and town & this rental had a perfect view of the ocean. My son loved sitting on the couch to look outthe window at the waves. We didn't have any issues with getting in/out of the condo. The unit was very clean and had all we were very confortable- especially nice and cozy with the fireplace. Had a great day at Westhaven State park. Checked out the lighthouse, which was pretty awesome at the top! Also had a blast at Granny Hazels Candy Shop & enjoyed our dinner at Blackbeard Brewery which was kid friendly. Check out the Westport Winery on the way in/out - loved the grounds and the wine! Definitly a great weekend! Great place to relax and enjoy the coast. This was a great condo. Spacious, clean and very comfortable. We had a great time in unit 333 - great views and space. The trail to the beach was confusing because of the dune recovery so some info about that in the units would be nice. My only suggestion for the unit would be some sort of softer topper on the bed (it’s VERY firm) and adding scissors in the kitchen supplies. Thanks for staying and sorry you were confused about how to access the beach currently. We send out an email to each guest before arrival explaining the dune restoration in progress and available beach access but you might have missed it. We're always happy to answer any questions or supply any needed items so just give us a call next time. See you again soon. Everything from the decor to the seating arrangements made this unit a wonderful place to stay. I would highly recommend this place to just about anyone, and this unit is perfect for having a big group. Our unit and experience at VBTS was truest great as always. 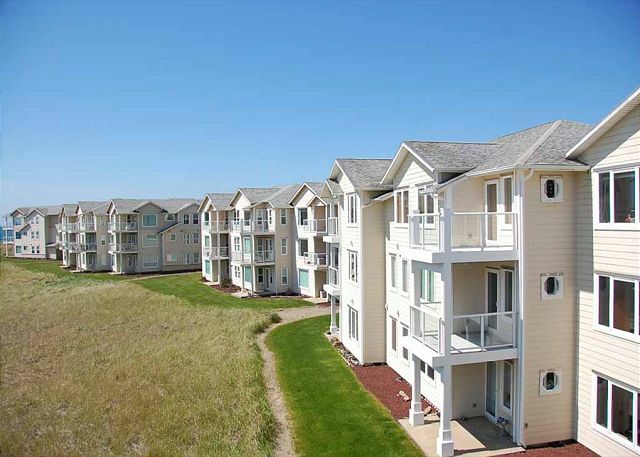 The unit is really nice, comfortable and had a great view of the beach. We love staying out there with the approximity to the beach and the town. The staff is always very polite and professional. We will definitely definitely be back again. We hate to eat out because we are such good cooks ourselves. We cooked all breakfasts and dinners in this kitchen with the beautiful view. Shrimp scampi the first night and picked up two cooked crab in town for another night. Love this location and the view is dynamite. Rental was clean and as shown and described. Facility and beach were very nice and pleasantly not busy. Emptiest beach we have been at in a long time. Not a good shell beach but lots of sand dollars! Would go again. Absolutely love this condo. The giant couch was so great for relaxing, the patio was perfect for sunset watching, the kitchen was well equipped for dinner making. This place has it all! We actually used the second bathroom as a baby room and it fit her pack and play perfectly. Thanks so much! Maggie and Shammi are our Golden Retrievers and had never been to the ocean. Our first challenge was to find accommodations that were “pet friendly. 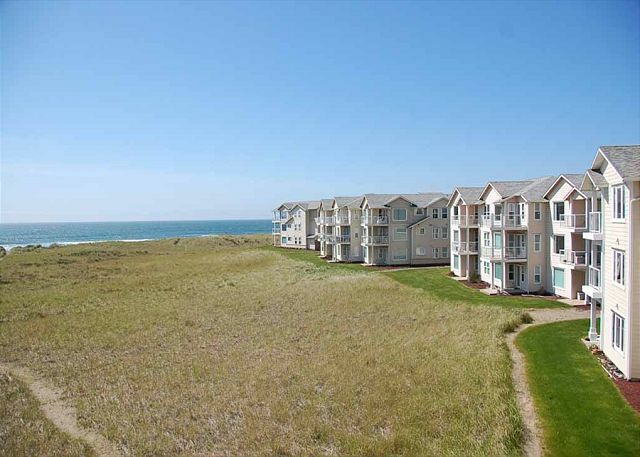 Friends shared their information regarding their stay at a condo in Westport they booked through Vacations By The Sea. We booked condo #333, it was dog friendly, clean, clear instructions and well stocked for cooking. Booking our stay was easy, dogs loved the view (as we did). Will go back again!! Great views! Clean and comfy! Such a lovely home away from home! Loved the big couch and decorations!!! We have stayed at other condo properties in this complex in the 7 and the 8 buildings. This condo is my favorite because of its size and the extra half bath that was not in the others. The view is truly fantastic; we had gorgeous sunsets to watch from the front room and dining area windows. We were able to get into the unit a little earlier than checkin which was nice. Everything was clean and it was not heavily perfumed with room freshener (so annoying when that happens). Lunches at Aloha Alabama in town and at The Local on the way to Tokeland was delicious. We were very happy to find that Nelson's new digs out in Tokeland were well stocked with the various canned seafoods this time. Very worth the trip. I have already recommended this condo unit to friends! Excellent weather,well appointed unit with excellent ocean view. Very nice, well stocked condo. Lots of fun! Absolutely loved our stay. The condo was immaculate and cozy. Everything we needed was provided and more. We didn’t want to leave! The only flaw was the door was difficult to open with the key, I think the lock mechanism inside the knob is getting loose. This was an exceptional room for our family trip. Thank you for making our fifth straight year a wonderful experience! When I saw this condo online I knew it was going to be great from the pictures. When I saw it in person I was blown away. The place was clean, quiet and had such breathtaking views. The pictures don't do it justice. The beach was a short walk away. The condo had everything I needed for a nice relaxing weekend. The complex is clean and well maintained. I'd recommend it to anyone wanting a getaway and I am already dreaming about my next stay. Loved it! Clean, well appointed. Wouldn't have know it was a dog friendly room. Great location. Felt very much at home. We love getting out to Westport for a quick get out of the city spot. We brought our dogs for some beach play time and had amazing pizza at the new brewery just down the street. Wonderful to hear the condo was exactly what you needed, see you again soon. It was a very nice complex. The unit 333 was also vey nice. The condo was beautifully appointed, immaculate, and just a short walk from the beach. Perfect times three. This was our first time renting a condo. We just adopted a dog and wanted to bring him with us. We were so glad to find a rental that allowed us to bring our dog. The condo was really nice and we felt very comfortable. The pool, hot tub and work out room were great too. We really enjoyed our stay - clean, quiet and a great view! The only improvements we suggest would be to replace the large couch - no support and worn. Also, cleaning the plexy glass on the deck so the view can be enjoyed. From reservation to check out we had a very good experience. The process was easy and we loved our room. This was our first stay at an ocean front location. We will look forward to our next opportunity to stay again. Pricing is a holdback on a more extended stay so please if there are deals ahead keep us informed. The ocean view was great and the room was very comfortable. 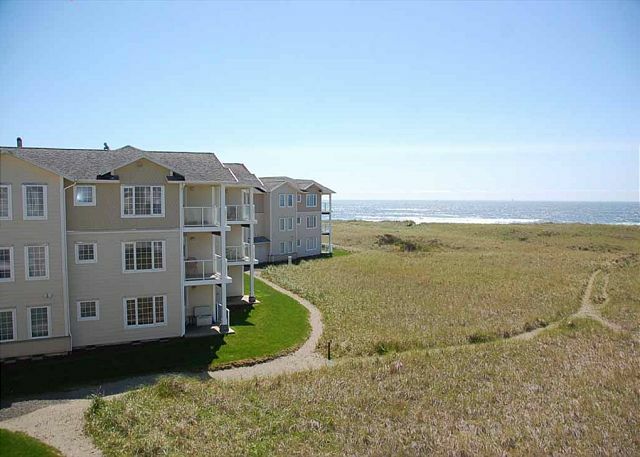 The condo was a perfect getaway for a couple who loves the washington coast. Close to the beach and a lovely view. Sun. Wind. Sand. Ball throwing. Bird chasing. Fresh clams. Wine on the beach. Oysters on the half shell. Fluff robes and NICE accommodations. Pleasant balcony with hard chairs. Did I mention a lot of ball throwing and bird chasing. I also believe she enjoyed playing in the surf. We had a great stay! Everything was perfect! The setting and views were special! We were so impressed how beautiful and clean our unit was! This was our first time here and it will not be our last. Nice little Greek Restaurant down the road and hand dipped ice cream in town. Peaceful and quite. Lovely unit with views of the ocean. We absolutely loved our stay here. Slight quibble about a slow draining bathtub, but other than that, great experience. Would definitely come back. Only took thirty minutes of being by the ocean to start feeling relaxed and refreshed! Will have to make the next stay longer. Loved everything about our mini vacation, proximity to town, to beach,the view , all of it. Great stay at Westport by the Sea! We loved our stay at Westport by the Sea! Watching the waves and beachcombing were just what we needed after a hectic week at work! Dog Friendly, so I will return. It was great. I have a great little dog who is clean, neat, and well behaved, and it is so nice to be able to go to a lovely place that allows dogs. The condo is very comfortable. Full ocean view is so relaxing. The kitchen has everything you need and there are even movies! I always enjoy my time at the condos and look forward to coming back. The condo had a beautiful view and met our needs. We had a fantastic experience in this condo. The interior and furnishings were very comfortable, modern and extremely clean. The view really cannot be beat. We also had a great time swimming in the (heated!) pool and using one of the rooftop grills in the complex. What a fun little weekend getaway! We will definitely be back! Pet friendly and only a little more than two hours from Seattle! This was our fourth rental of 333. It has truly become "our" vacation home at the ocean. Need we say more? Very dog friendly condo. We loved having so much couch space. The condo was very clean. There was a nice supply of books and movies to choose from. However, the best part was the gorgeous views! Breath taking with the Beach and its cool pathway to the beach. Where you can walk or run for miles and explore, enjoy the beauty of the sea breeze,shells,rocks, or just get a tan. We will be back .... And r little Joey (puppy ) loved it ?? The owners have created a memorable, family-friendly, pet-friendly home-away-from-home for their guests. The million dollar view, the proximity to the beach, and the continual, soothing sound of the waves washing up on the shore made this a relaxing weekend we will never forget. Loved the unit we stayed in. Beautiful view. Everything was so clean. And they even easily accomodated us for an extra night. Great place for us and the kids. Will come back again when the pool opens. Really classy!! Great location, clean, pet friendly, nice décor. We will rent again at Vacations by the Sea. We went to Westport to find a beachfront motel for the night. We called one motel and was referred to Vacations by the sea. Very pleased with the condo and the view. More than what we thought we were going to get. Really felt comfortable. Will be back for sure. Happy to hear we exceeded your expectations. Many guests say once they stay at Vacations by the Sea instead of a local motel, they will never go back! See you again in the future. Great place!!!! The only thing I could say is that there were no coffee filters for the coffee maker and coffee that was provided. I used a paper towel and that worked fine. The place was great and we will be back. Thanks for staying and glad you had such a wonderful visit to the beach. Sorry for any confusion about the coffee, no filter is needed since the coffee is already inside a filter pack once you open it. Just toss it in the normal place of the coffee maker and it all works out. Use two of them if you plan to brew a big pot or want it really strong. We'll always bring more supplies if you run out. See you again soon. Loved the comfortable feeling of the condo. Loved the view. Love that they accept dogs. A great place to get away for a long weekend. We will definitely return! The condo was very nice and it was great that I could bring my dog. But this is Westport, I could get a condo on the beach in Maui for the same price. $275 bucks is overpriced. We're happy you enjoyed your stay, including bringing your dog to the beach. It should be mentioned the price included all taxes and a $30 pet fee for the one night during our peak season. Give us a try during our fall or winter seasons when we have more availability and the nightly rates are less. Thanks for staying. A very nice and clean place to stay. Great view. Large single bedroom condo. The Perfect Vacation by the Sea! The property was AMAZING! The beach walks, paved bike/walking trail all the way to 'downtown' with ocean view, property swimming pool/hot tub/tennis courts/etc. were beautifully maintained and all the amenities in the condo were perfect. The easiest vacation ever. We will definitely be back. great place, very clean, modern. It was peaceful and relaxing. We had a wonderful stay. The view was perfect. The condo was very clean, spacious, and comfortable to stay in. We had a very relaxing vacation, loved the pool and basketball court, and found the complex very quiet. Opening the door to the deck was a great way to let in the sea breeze. Like staying in a model home...and pet friendly! It is worth navigating up to the third floor for the view, the freshness of modern décor and the comfort of a well maintained condo. As the owners of a Havanese, we appreciate that pet friendly doesn't have to mean second rate! We had a great time on our vacation! Vacations by the sea is very well taken care of and has a beautiful location on the water. I loved all of the sand dollars! The best thing about our location is that it was a reasonable distance from our previous stay at Mt. Rainer and we were able to take a lot of day trips (for example: cannon beach, Portland, Olympia). We were surprised to learn how quiet the town of Westport is. This would be great if you are looking for a quiet, well cared for, stress free and beautiful weekend getaway. For a couple who traveled cross country, we were looking for a little more to explore than we could find in Westport alone, but luckily it was only a day trip away! You can not beat the price we paid for a beautiful condo. Even the toilet paper was foiled into triangles!! And only a little more than two hours from Seattle! Tastefully decorated and spotless, this unit is perfect for a relaxing vacation or weekend getaway. Don't be daunted by a third floor without an elevator. The view is worth the extra effort. One of our best weekend getaways. We love the coast, and this was perfect from the accomodations to the view. Haven't had a bad experience in 4 years! Vacations by the Sea kind of has a monopoly going out there in Westport. It really is the only nice place to stay that is affordable. You would think that customer service wouldn't be the priority for such a monopoly, but it is! We have been going to VBS every April for the last 4 years in a row and we have not been disappointed yet! It is always hard to find a nice clean place where you can take your dog too! We always appreciate that VBS runs special deals from time to time as well. It makes our stay a little more budget friendly for a young family! This was our second stay in 333 - great until! We enjoyed staying at vacations by the sea. This is our second stay, both in 333, and loved it. Clean, comfortable, and relaxing! The fireplace is fake, that was our only disappointment t. The grounds are beautiful and lots to do: basketball, park, BBQ, hot tub. It was a quiet weekend, a pleasure to experience such beauty and tranquility. These Condos are perfect for a quick escape from reality! Our place will always be there for you whenever you are looking to make a quick escape to the tranquility of the coast. Thanks for staying. Great room ..great view...all the amenities you would want. Close path to the ocean . All in all a relaxing experience! We don't want to recommend VBTS because at times we have a hard enough time booking our favorite room (we have dogs), much less if people find out about this, our MOST FAVORITE short vacation place. We love that we can take our dogs with us. Would love an outside warm water rinse-off for the dogs for the wintertime cold. It is SO freezing to rinse them off, but at least there are hoses for that purpose. Thanks! 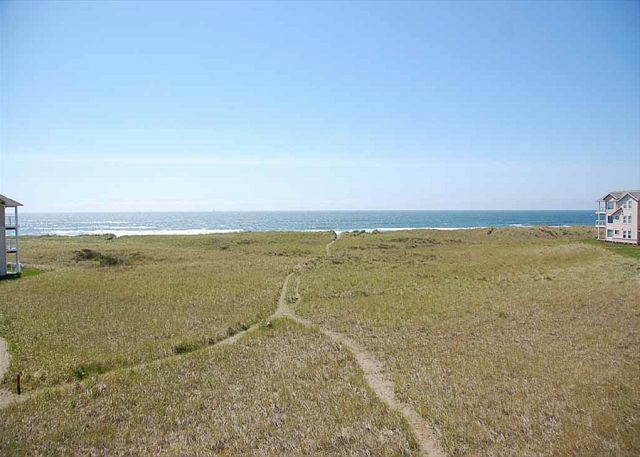 We're pleased you enjoyed your stay with us and found the wonderful Lighthouse Dune Beach Trail. It is one of our favorite things about living here at the beach. During a walk the other day we spied a huge white snowy Owl perched on a post near the surfing beach. This was the 1st one we've seen along this part of the coast! See you again soon. We had been here before and it was just as nice and accomodating as we remembered. Could not be more pleased with the cleanliness, location and overall professionalism of our stay. Thankyou! We couldn't have picked a better place. We celebrated our 49th anniversary in 333. The rain and wind started the day we arrived and continued until we headed home, but that didn't stop us from walking the beach and enjoying the town. We can't wait to come back. It was exactly what we came for. My wife and I had a wonderful stay in this condo. It was all I could have hoped for and more!! The condo was in great shape and was well outfitted. The view of the ocean for the condo was breathtaking!! I absolutely loved it there and my wife and I cannot wait to go back again!! We were pleasantly surprised when we walked into a condo that could pass for a model home! And it is worth the extra effort of a third floor walk up for the breath taking view. Since we live just a little over a two hour drive from Westport, we know that we will return again and again to Unit #333. Used 2 different units and both were great. Our family, including our 2 dogs, enjoyed a sun-filled long weekend in this beautiful condo. The views were fantastic and we ejoyed all the amenities of the complex -- hot tub, pool, grills,lots of board games and DVDs, and of course the star feature -- the beach. The grounds are immaculate and dog owners are responsible. There is a great 2.2 mile jogging/walking/bicycling paved path along the upper dunes area for those wanting additional exercise venues. Couldn't have been a better way to spend the weekend. We thoroughly enjoyed our second experience staying in this beautiful condo, walking along the beach and visiting the surrounding area. Condo 333 was very nice - comfortable and clean with a lovely view. The property mgt team replaced a coffee maker that was not working but could not get the TV in the bedroom working because it was a weekend. So we paid for that extra TV which we never used so that made one person unhappy and the other was just fine with it. Thanks for staying with us and sorry there was an issue with the cable in the bedroom. It required some help from Comcast but all is working fine now. Hope you got to spend some extra quality time together. Quick trip back to Westport for old times sake. Lovely condo. Peaceful. Great place to get away for a weekend. In the past my wife and I would generally save some money and get a room at a less than desirable motel. We thought "What's the difference". Until we stayed at Vacations by the Sea. I cannot tell you enough how much of a difference it made to us staying there. It was like a home away from home. Even our golden retriever Odie enjoyed his stay. Generally he's not too thrilled to stay in a motel, but he loved it there. I could tell that he immediately felt comfortable, of course as we did. His favorite spot was the balcony and I spent much of my time there too, when I wasn't out doing other things. We will be a regular. We really enjoyed staying in #333 -- the view of the ocean was amazing and it was so close and convenient to the beach. We loved the fact that it was dog-friendly and could bring our little dogs with us (they love running on the beach!). The amenities for this condo were just what we were looking for -- king-sized bed, large sofa that we could relax upon, TVs in both rooms, and chairs on the patio so we could relax and enjoy the sunset with a nice glass of wine. I would definitely stay here again! Thanks for visiting! We are glad your little ones enjoyed the beaches at Vacations by the Sea - see you soon! Fantastic view! Clean, cozy and relaxing. This the only room we will choose in the future. We're glad you enjoyed this beach home & look forward to seeing you at Vacations by the Sea in the future! We really enjoyed our stay here. We were busy while we were in town so didn't get to hang out very much at the condo, but we definately intend to return when we can take advantage of more than just the wonderful view from the room. We had an occasion to call management (help with wi-fi) and they were very responsive and friendly. Every aspect of the rental was great from the original reservation through the check out. Thank you for the great review and we're glad you were able to get out and see all that Westport has to offer. Wi-fi is complimentary for our guests and available in all of the condos we manage so if it is not possible to disconnect completely from the world it is always available to keep in touch. See you again soon. If you enjoy quiet, comfortable, relaxing, and an amazing view of the sea, this is the place. These rooms allow you to make some coffee or whip up an impressive breakfast while still in your pj's watching the surf roll. You can sit by the large front room window, or out on the deck and watch the tide come and go, and watch the fishing boats and ocean ships passing. Unlike some other beach communities, this area is very uncluttered. You seemingly have the place to yourself; there just are no crowds. The sunsets can be spectacular; and you can relax ( still in your jammies, if you like) on your deck till after midnight just drinking in the magesty and power of the Pacific and a starry night. The rooms and grounds are always clean. We know there is a traffic of guests, but there is never evidence inside or out. You feel like you're the first one to check in. We've been here (perhaps) a dozen times and we love it. We tell everyone to visit Vacations By The Sea. WOW! Thanks for the kind words, and for coming back so often. We are so happy you enjoy your time here & look forward to seeing you next time! My wife enjOyed our time at this property so much that we stayed an extra night! We loved everything about our experience from the beginning to end. Thank you for allowing us to enjoy our vacation! We wanted to get away for a night and Vacations by the Sea was a perfect location. It was easy to get to, the unit was perfect ... clean, plenty of ammenities, and what a view! I would recomend this unit / locaiton to everyone. Thanks for the wonderful comments. We are glad you were able to get away, and that you chose to stay at Vacations by the Sea! See you again soon! We love going to Wesport and staying at Vacations by the Sea. The best part is being able to bring our dog with us. I've stayed in pet friendly places before but I am always pleased with the cleanliness of the pet friendly condos we stay at! Thanks! Thank you for the great review and we're happy that so many of our owners welcome guests traveling with pets into their homes. Hope to see you again soon. Great condo and very nicely furnished with everything you would need for a vacation rental. Awesome view!! Really comfortable. Housekeeping and maintenance needs to be fined tuned. Check your dish's and silverware before using. Thank you very much for your comments, we love to hear the good and appreciate hearing how we can improve our guests experience. We are pleased you like the condo and enjoyed your stay. We are fine tuning our housekeeping checklist to make sure nothing gets missed in the future so our guests have a great stay. See you again soon. Excellent! We can't wait to return. We had a wonderful experience. The condo was beautiful, clean, and offered several amenities. The property was equally maintained and offered plenty to do. We highly recommend vacations by the sea, condo 333.